Thoreau's Reading charts Henry Thoreau's intellectual growth and its relation to his literary career from 1833, when he entered Harvard College, to his death in 1862. It also furnishes a catalogue of nearly fifteen hundred entries of his reading, compiled from references and allusions in his published writings, journal, correspondence, library charging records, the catalogue of his personal library, and his many unpublished notebooks and commonplace books. This record suggests his literary and intellectual development as a youth primarily interested in classical and early English literature, who matured as a writer investigating contemporary and classical natural science, the history of the European discovery and exploration of North America, and the history of native Americans. 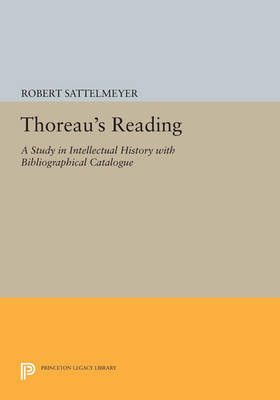 The catalogue provides bibliographical data for, and lists all Thoreau's references to, the books and articles that he read. The introductory essay traces the shifts in his literary career marked in the chronology of his reading. The book reveals a Thoreau who was deeply interested in and conversant with the major intellectual questions of his times and whose stance of withdrawal from his age masked a lively involvement with many of its most perplexing questions. Originally published in 1988. The Princeton Legacy Library uses the latest print-on-demand technology to again make available previously out-of-print books from the distinguished backlist of Princeton University Press. These editions preserve the original texts of these important books while presenting them in durable paperback and hardcover editions. The goal of the Princeton Legacy Library is to vastly increase access to the rich scholarly heritage found in the thousands of books published by Princeton University Press since its founding in 1905.